Click to download/play this file. Everyone seem to have an opinion about what the “correct” libertarianism is. What are its limits? What are the areas in which libertarians get bogged down in semantic arguments and minutiae, and what are the arguments that really matter? 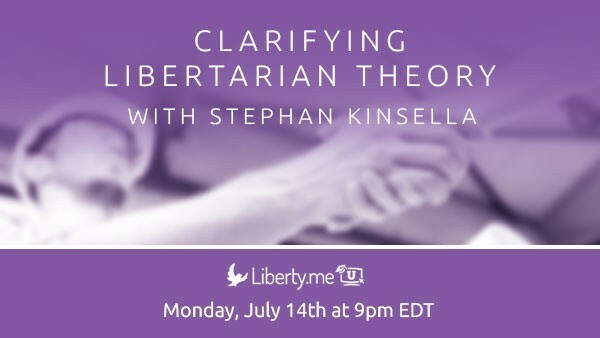 Stephan Kinsella believes that he has the answers, and will share them Monday, July 14th at 9pm EDT! Happy Halloween! Join us for a not-so-spooky day in Istanbul, Turkey for the livestream of the 2nd annual ESFL Regional Conference. Program includes: Keynote Speech: Dr. Tom G. Palmer is a senior fellow at the Cato Institute, and director of Cato University, the Institute’s educational arm. Palmer is also the executive vice president for international programs at the Atlas Economic Research Foundation, and is responsible for establishing operating programs in 14 languages and managing programs for a worldwide network of think tanks. Speech: The Libertarian Movement: Where We Are, Where We Are Going James W. Lark, III is a professor in the Department of Systems and Information Engineering and the Applied Mathematics program in the Department of Engineering and Society at the University of Virginia. He has also served as a professor in the Department of Statistics and the McIntire School of Commerce at the University of Virginia. In addition, he has served as Assistant to the Athletics Director for Special Projects at the University of Virginia. Speech: The Liberal Case For Open Borders Sven Gerst is a PhD student at the Department of Political Economy at King’s College London. His research mainly focuses on matters of political and moral philosophy —in particular, Global Justice, Open Borders, and Business Ethics. Speech: Victimless Crime and Drug Prohibition Yunus Emre Kocabaşoğlu is a libertarian activist in Turkey. He completed his major in Hacettepe University in Ankara. He was an instructor in Netherlands at Groningen University. Sheldon Richman and Lucy Steigerwald, liberty extraordinaires, will grace your screen once more with another solid episode of Free Association! Tune in this week for his views on limited government. Julie Borowski, one of the most entertaining names in liberty, is launching her new website. And she's on Liberty.me LIVE to celebrate it with Jeffrey Tucker — and you! All are welcome to attend. Check out Julie's new blog on Liberty.me too! Not a member? No problem! You can attend too through this link -- click "Enter as a Guest." Are libertarians self-centered and anti-society? Mainstream critiques of liberty and individualism often portray libertarians as rugged hermits who care nothing for others and idolize self-sufficiency, but Sheldon Richman argues that this is hardly the case. Why did this misconception propagate, and how can we combat it? Join us as the Future of Freedom Foundation presents this frank discussion with Richman Tuesday, December 16th at 8pm EST! A book that lays bare the failings of the British political establishment and system, penned by a famously robust critic of the European Union and its politically correct tyranny. "I have been called “a dinosaur” more times than I can remember - usually by some politically correct policy wonk who can’t be bothered to debate the issues and prefers to insult his opponents. Nothing wrong with dinosaurs. They dominated Earth for over 120 million years. Political correctness has managed 15 years so far. Classical liberalism and libertarianism is the only possible salvation for mankind, it looks to the future not the past. This book is about why we are governed or why we are governed in the hopelessly inefficient, corrupt and incompetent way we are. It contains more questions than answers yet I make no apology for that. I believe in the English speaking world in the last hundred years we have stopped asking appropriate questions, without which we can never find answers, right or wrong." - Godfrey Bloom Join Godfrey for a discussion of his book, libertarianism, his time in the European Parliament, and more Tuesday, December 2nd at 3pm ET! In 1785, 25-year-old Thomas Clarkson entered a Cambridge essay contest with the prompt "Is it lawful to make slaves of others against their will?" His response, and his subsequent 46-year fight against the evils of slavery truly changed the face of the Western world. Join Larry Reed to learn more about this inspiring tale and perhaps take home some inspiration of your own in the modern fight for liberty Tuesday, September 23rd at 9pm EDT! Much is made among liberty-lovers of the divide between utilitarian and deontological approaches to liberty. Roderick Long, however, suggests a third way. He proposes a "eudaimonist" or "virtue ethics" approach, which in the tradition of Aristotle theorizes rights as interpersonal normative principles. Join Roderick as he explores this view Thursday, September 18th at 8pm EDT! "The Law" is one of the oldest, yet one of the most influential, classically liberal texts. Frederic Bastiat's works are still repeatedly cited today. Why is "The Law" still so influential and what can you learn from it? Join Jeffrey Tucker for a discussion of this book and its legacy August 17th at 8pm EDT! What does it mean to own yourself? What does it mean to voluntarily interact with your fellow human beings? What does it mean to be free? And does the government acknowledge your status as a self owner with rights? Adam Kokesh from Adam vs. the Man discusses his new book, FREEDOM! August 12th at 9:30 EDT! In response to the bad rap capitalism gets in the mainstream, philosopher Jason Brennan makes a stunning moral defense of the economic system. Is capitalism exploitative? Immoral? Destructive? Brennan addresses these criticisms and more. Join Jason to discuss his book and ask your questions August 6th at 9pm EDT! Jason Brennan (Ph.D., 2007, University of Arizona) is Assistant Professor of Strategy, Economics, Ethics, and Public Policy at Georgetown University, where he teaches courses in ethics, political economy, moral psychology, entrepreneurship, and public policy. He was formerly Assistant Professor of Philosophy, Research, at Brown University. He is the author of Why Not Capitalism? (Routledge Press, 2014), Compulsory Voting: For and Against, with Lisa Hill (Cambridge University Press, 2014), Libertarianism: What Everyone Needs to Know (Oxford University Press, 2012), The Ethics of Voting (Princeton University Press, 2011), and, with David Schmidtz, A Brief History of Liberty (Wiley-Blackwell, 2010). He is currently writing Markets without Limits (Routledge, under contract, with Peter Jaworski), and Against Politics (Princeton University Press, under contract). The non-aggression principle has been under attack by many libertarians as of late. Mr. Libertarian, Walter Block, argues the non-aggression principle is libertarianism itself --that the philosophy of libertarianism is about when it is appropriate to initiate the use of force. Nothing more, nothing less. Join Walter as he defends the NAP July 12th at 4pm EDT! This monograph is justifiably considered a modern classic. It is by Stephan Kinsella who caused a worldwide rethinking among libertarians of the very basis of intellectual property. Mises had warned against patents, and Rothbard did too. But Kinsella goes much further to argue that the very existence of patents are contrary to a free market, and adds in here copyrights and trademarks too. They all use the state to create artificial scarcities of non-scarce goods and employ coercion in a way that is contrary to property rights and the freedom of contract. Many people who read this essay for the first time were unprepared for the rigor of his argument, which takes time to settle in simply because it seems so shocking at first. But Kinsella makes his case with powerful logic and examples that are overwhelming in their persuasive power. The relevance in a digital age can’t be overstated. The state works with monopolistic private producers to inhibit innovation and stop the progress of technology, while using coercion against possible competitors and against consumers. Even U.S. foreign policy is profoundly affected by widespread confusions over what is legitimate and merely asserted as property. What Kinsella is calling for instead of this cartelizing system is nothing more or less than a pure free market, which he argues would not generate anything resembling what we call intellectual property today. IP, he argues, is really a state-enforce legal convention, not an extension of real ownership. Few essays written in the last decades have caused so much fundamental rethinking. It is essential that libertarians get this issue right, and understand the arguments on all sides. Kinsella’s piece here is masterful in making a case against IP that turns out to be more rigorous and thorough than any written on the left, right, or anything in between. Read it and prepare to change your mind.